If you are looking online for a trampoline for sale then we highly recommend our low cost trampolines which have the same superb quality as the full sized round trampolines but at a lower price. One of the most popular sized trampolines purchased by people who search for a trampoline for sale are our range of 10ft trampolines. This size of trampoline consists of a decent sized frame and jump pad but not to big that it takes up most of the garden. The price is also almost half of a full sized trampoline such as the Jumpking OvalPOD which is still our best selling trampoline and was throughout 2008. Jumpking have just released a smaller sized JumpPOD which you maybe interested in if you are looking for a medium sized trampoline. If however you are after a medium to large trampoline and happy to purchase a new trampoline instead of a trampoline for sale so second hand then the Jumpking range are superb. As mentioned above, the OvalPOD is extremely popular but we have a great range of package deals for many other sizes from 8ft to 16ft trampolines. 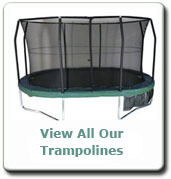 When looking for a trampoline for sale, a trampoline with an enclosure is a very good investment as this gives parents peace of mind that their children and their friends are not going to fall from the trampoline and cause themselves harm.